Back in Catholic School, our teachers used to tell us to "leave room for the Holy Spirit" when we would slow dance. With Pope Francis doing away with so many antiquated traditions (he's not regular Pope, he's a cool Pope! ), he might just switch that kind-of-creepy mandate to "leave room for an extra-large pepperoni deep-dish pizza." The Pope loves his pizza. He cannot take a wife, but I kind of think he's married to pizza (which is not forbidden in the Bible, by the way). His fans even present him with pizza in public as a sign of affection. 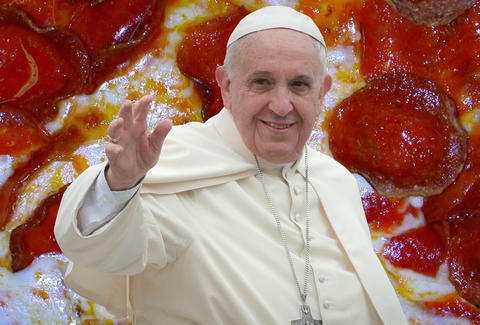 We love pizza, too -- so we decided to make a timeline of all the instances his Pope-li-ness got his infallible mitts wrist-deep in flamin' Italian sauce disks (which is what they call pizza in the Vatican, I'm pretty sure). The power of crust compels you! Just this month, Archbishop Konrad Krajewski -- one of the the Vatican's top aides -- has been taking groups of homeless in Rome to enjoy slices of pizza at the beach outside Italy's capital. The entire operation is funded by the man in white himself, who joins some of the groups when he has time. I feel like this is exactly what Jesus would do. Pope Francis set a precedent for his recent pizza-fueled altruism by showing up at a drug rehabilitation center in Rome packing positive vibes and more than a few pies. I feel like that show Intervention would have gone a lot smoother if those people knew they had pizza waiting for them in treatment. The Pope visited New York in the fall of 2015, and the entire city apparently celebrated by showering His Holiness with pizza tributes. Hey! Only in New York, amiright? The pizza windfall was prompted by a statement Father Hernan Paredes -- the Pope's bff -- gave to Fox 5 news. “He said that he wished to go out and to have a piece of pizza,” Paredes said. Poor Pope. All he wants is a slice. Fame does have a dark side. In a candid interview with Argentinian newspaper La Voz Del Pueblo, Pope Francis lamented his newfound fame, and the pizza problems it brings. This was the first time he publicly spoke about his love of pizza, as Pope. "To go outside... that much I long for, the tranquility of walking though the streets, or to go to a pizzeria to eat a good pizza," he told the paper (in Spanish). The Pope then goes on to say he can still get delivery, but it's simply not the same. Has he heard of DiGiorno? When the Holy Father visited Naples, local pizza joint Pizzeria "Don Ernesto" took it upon themselves to get in the Pope's face, and deliver him a freshly baked, customized pie right to his very own popemobile. Apparently, the Pope said “I’ll have it later,” according to ABC News. And if it isn't blessed in 30 minutes or less -- it's free! And celebrates with an entire plain cheese pizza, Kevin McCallister style. I mean, probably. I can't be sure. OK, I made this one up. Wil Fulton is a staff writer for Thrillist. He likes grapes but hates grape-flavored stuff. It's one of life's great mysteries. Follow him @wilfulton.